“Jaws” was the biggest movie in theaters, “Love Will Keep Us Together” was the top song on the radio and 10-year-old Nagin Cox’s home life was unraveling. It was a time when Cox thought only about making it to age 18 so she could be free. That goal revealed itself when she was 14, a curly-haired Indian girl fascinated by “Star Trek” and Carl Sagan’s “Cosmos.” She wanted to explore the universe. And no, she didn’t want to be an astronaut. She just needed to figure out how. Cox, now 53, is celebrating 25 years since first walking through the gates of JPL. Since her first day in 1993, she has written the acronym IWWTWTF in the top right-hand corner of every notebook. It stands for I was willing to wash the floors—a reminder of just how badly she wanted to work at NASA. 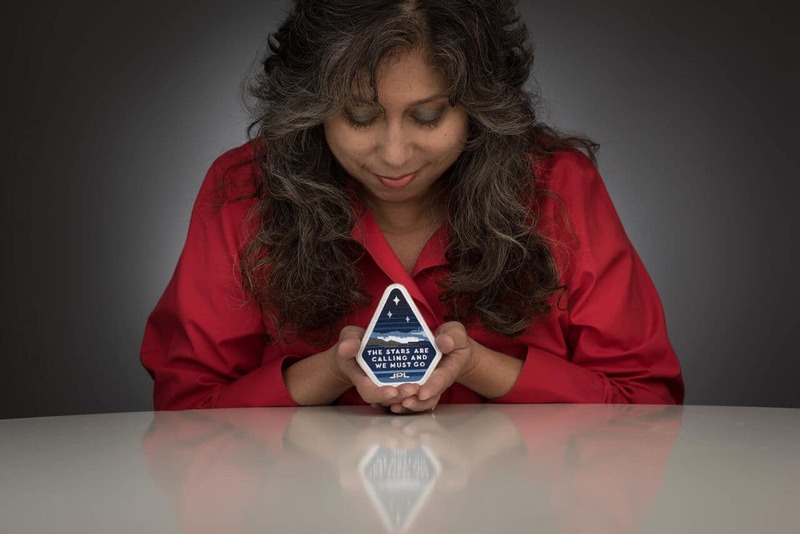 For two-plus decades, she has taken part in such iconic NASA missions as Galileo, the Mars rovers Spirit, Opportunity and Curiosity, the exoplanet explorer Kepler, and InSight, a lander that will measure “quakes” to study the Martian interior. Cox has boundless energy beneath a cherubic face with wide, inquisitive eyes and a melodic voice. With her warmth and good-natured sense of humor, it’s hard to imagine she’s the product of a tough childhood. But, in many ways, her upbringing helped deliver her to her calling. Cox as a high school student growing up in Kansas City, Kansas. Cox was born in India and raised primarily in Kansas City, Kansas, the second eldest of four siblings. Her father was a political science professor at the University of Missouri at Kansas City. Her mother stayed at home to look after the family, but studied sociology in India and was one of the first women in her province to earn a master’s degree. Cox’s relationship with her mom was especially close. “She was a fountain of love and support and encouragement,” she says. As she got older, she began to notice different expectations in the household for boys and girls. Her two brothers were sent to a middle school known for math and science, and she was sent to a different school specializing in art and humanities. At dinnertime, the women in the family were expected to cook and serve food. For years, she remembers her father saying girls were “worthless.” During this time, Cox grew especially close to her mother. With her mother in the summer of 1983. The turning point was in 1981. A high school junior, Cox spotted an Air Force trailer behind her school. Even though she didn’t want to be an astronaut, she knew many had a military background and it might be her ticket to NASA. That spring, Cox’s advisers started asking which colleges she would choose from, but she hadn’t heard anything. Then it dawned on her: Her father was throwing away her letters. She eventually got the good news: She had been accepted into Cornell. Cox started Cornell in the fall of 1982, double majoring in psychology and operations research and industrial engineering. In college, Cox also met her future husband, Earl. A tall, handsome engineer with a megawatt smile, they met through the Reserve Officers’ Training Corps—she in the Air Force program and he in the Navy program—and dated for six weeks before she dumped him because she thought he was “an arrogant know-it-all.” Alas, he was a lovable, arrogant know-it-all—the two later eloped in 1992. At a Cornell University ball with her future husband, Earl. After four years at Cornell, Cox swapped her graduation gown for an Air Force uniform in 1986. With NASA as her endgame, she set her sights on systems engineering at Wright-Patterson Air Force Base in Dayton, Ohio, helping build F-16 aircrew training systems. She later earned her master’s degree in space operations engineering at the Air Force Institute of Technology and worked as an orbital analyst for U.S. Space Command Operations at Cheyenne Mountain Air Force Base. Cox during her Air Force years, pictured here at age 25. After six years of active duty, Cox mailed in her application for an engineering position at JPL. She waited—and was met with resounding silence. But a high school reunion helped her eventually connect with a former classmate working at JPL. She called him soon after and learned he was about to leave for graduate school. And something greater requires sacrifice, including Thanksgivings spent in Mission Control and missing friends’ weddings. The work doesn’t let up these days, either. On a recent Wednesday, she had a “three-rover day”: She was on shift for Curiosity all day, went to dinner with the Mars Exploration Rovers team in the evening and then came home to work on Mars 2020 at night. Driving the test rover “Scarecrow” in 2013 at NASA’s Jet Propulsion Laboratory. Even though there is a back entrance to a parking lot much closer to her office, Cox prefers to drive onto lab through the main entrance, where she can see the NASA logo and the Jet Propulsion Laboratory sign. “I don’t drink coffee and I don’t drink tea, but I do like to see that sign in the morning to start the day off right,” she says. On the Mars 2020 mission, the next rover that will fly to Mars, she’s both the deputy team lead for the engineering operations team and the operations test and training manager, helping develop operations processes and tools for operating the rover. Rob Manning, JPL’s chief engineer, has known Cox since her early days on Galileo and supervised her on the Mars Exploration Rovers after she knocked on his door and asked to work on Spirit and Opportunity as a systems engineer. Cox on a 2013 State Department trip STEM diplomacy trip, one of dozens she has participated in since 2004. In Cox’s free time—which must exist on some separate, invisible plane of time—she is often traveling the world speaking to audiences about exploring the universe. To date, she’s given almost 700 lectures in 20 years of outreach, has nearly 2 million views on her “Mars Time” TED talk, and has visited dozens of countries on STEM diplomacy trips, many as a U.S. State Department speaker since 2004—all on personal vacation time. Having come so far in her journey of space exploration, Cox has discovered a sense of peace and forgiveness that she never expected. The challenges of her childhood have given way to an adulthood full of satisfaction, wonder and happiness. Her parents eventually divorced and her mother learned to drive at 40 and got a job at a bank; her father, in later years, “tried to learn to love more.” While both passed away several years ago, she has come to an accepting, even good-humored, perspective of her upbringing now. Cox leads an active social life that has included hobbies like dragon boating, sprint triathlons and improvisational comedy. On the philanthropic end, she has volunteered for suicide prevention programs, is the first engineer to sit on Human Rights Watch’s advisory committee for women’s rights, and served on the Griffith Observatory board for more than 10 years.